This blog was originally featured on NPR's blog on Wednesday, December 4, 2013 at 6:10/8:10am ET. Read the original blog here. Lawmakers on Capitol Hill face a lengthy to-do list before they head home for the holidays. Near the top is an issue deemed a priority after last year's election — immigration reform. So far, only the Senate has passed a bill. Despite the standstill, supporters of immigration reform are pushing to keep the issue alive on a crowded legislative slate. For a group of protesters on the National Mall, the strategy has become dramatic and drastic. After 12 days of no food, just water, dark rings circle the eyes of activist Rudy Lopez. "The hunger has gone from sharp pain to now more of a constant companion that I've gotten used to," says Lopez, a community organizer from East Chicago, Ind., with the Fair Immigration Reform Movement. He's part of a rotating cast of activists, including union and faith leaders and now Rep. Joe Kennedy III of Massachusetts, fasting to put pressure on the House of Representatives to take up immigration reform. Lopez says he plans to fast until his body "can't continue," stressing that none of the demonstrators has a "martyrdom syndrome" in mind. Instead, the group is trying to raise awareness of the estimated 11 million unauthorized immigrants currently in the U.S. who, the protesters insist, should have a path to citizenship. It's a message that President Obama, two House Republicans from California and other politicians have heard firsthand during recent visits with the group. Eddie Carmona, a citizenship campaign manager for PICO, a network of faith-based community organizers, started fasting Saturday. He says they've gained lawmakers' attention, but they're still waiting for legislative action. "We need to see [lawmakers] move legislation forward, and we need to see [House Speaker John Boehner] move legislation to the floor for a vote," Carmona says. At a recent press conference, Boehner called immigration reform a "very important issue" that has been the focus of behind-the-scenes discussions on Capitol Hill. "Is immigration reform dead? Absolutely not," Boehner told reporters. "I've made clear going back to the day after the last election in 2012 that it was time for Congress to deal with this issue." Patience, though, among some activists is running thin. A speech on immigration by Obama was interrupted last week in San Francisco by Ju Hong, an unauthorized immigrant from South Korea. "You have a power to stop deportation for all undocumented immigrants in this country," Hong told the president. "Actually, I don't. And that's why we're here," responded Obama, who stressed the need for a legislative solution. Brent Wilkes, national executive director of the League of United Latin American Citizens, strongly supports the push for immigration reform. But he's operating on a different timeline. "The real clock is this session of Congress doesn't end until next December," says Wilkes, who expects that the House will vote on immigration bills by April or May. "This has been a long, long process for us, well over 20 years, and we're not so impatient that we can't wait four more months," he adds. Other supporters of immigration reform say the wait has lasted long enough. "We want action now, and we will continue to demand action now," says Cristina Jiménez, managing director of United We Dream, a network of organizations advocating for young immigrants. "For us, it's not about the timeline that the legislators say," Jiménez explains. "If we were to be guided by the legislators' timeline, we will never have certainty on the fight that we need to lead for our communities." Jiménez's group recently helped organize a protest outside Boehner's home in Washington, D.C. — part of a wave of demonstrations around the country that have focused on winning support in Congress. Despite the pressure, Boehner has told reporters that he remains committed to taking a "deliberative" approach. "The only way to make sure immigration reform works this time is to address these complicated issues one step at a time," Boehner said at a news conference. Those steps are taking too long for activists like Jiménez, who says her group plans to push the president to take executive action in 2014. LULAC is proud of its partnership with Walmart which builds awareness regarding the importance of healthy living in Latino communities. Together we have sponsored health festivals in Puerto Rico, California, and Texas where thousands of Latinos have benefited from information and resources on how to live healthier lives. Walmart has supported these efforts because it believes in providing our community with every opportunity to succeed. Other efforts which demonstrate Walmart’s commitment to improving our community include providing job opportunities resulting in increased financial stability to Latino families across the country. At the Los Angeles Feria de Salud, pharmacists from the local Walmart informed festival participants of affordable options for prescription insurance at the stores. 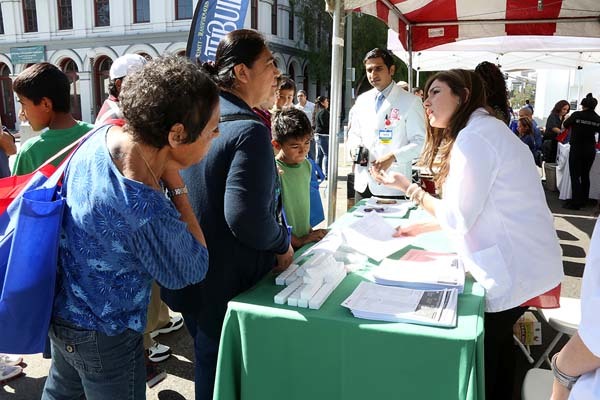 Over 16,000 participated in the most recent Feria de Salud. For more pictures, click here.